Growing up in Indiana there were very few opportunities to explore the world without leaving home. The one exception, of course, was food, but this convenience came with confusing pedigrees—Greek and Indian dishes essentially reshaped to fit Hoosier tastes. It was only later while studying in England and excavating in Greece that I learned the true scale of the problem. The food served at British Universities in 1986 was comically horrible (and I suspect still is), but it did have the unexpected benefit of forcing you to try the wonderful Asian, Indian, and Turkish restaurants—most of which tasted nothing like their Hoosier counterparts. Later while exploring the prehistory of Greece, I enjoyed a similar revelation. In a country where culinary and archaeological discoveries come hand in hand, there were surprisingly few dishes resembling those I had sampled in Greek tavernas in Indianapolis or Philadelphia. 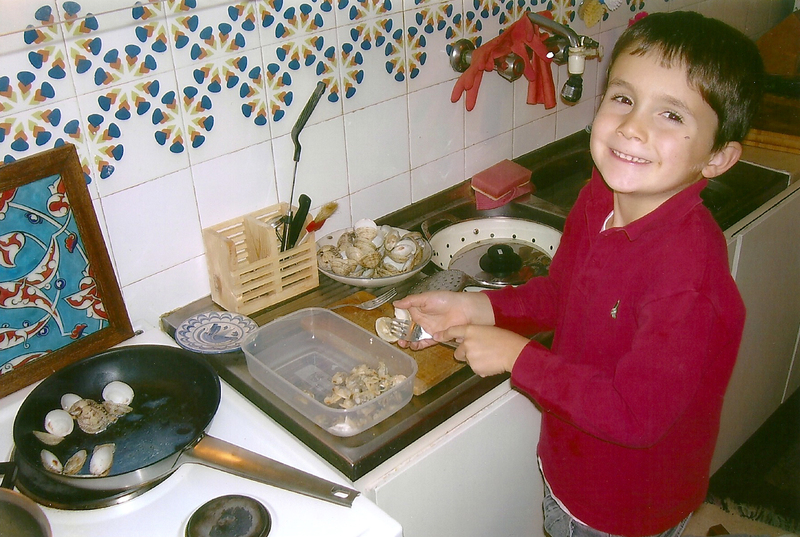 The reason was an unexpected but very real lesson in any ex-pat’s life–the frustration of trying to recreate meals from home, which lies at the heart of this story. Growing up in Indiana. 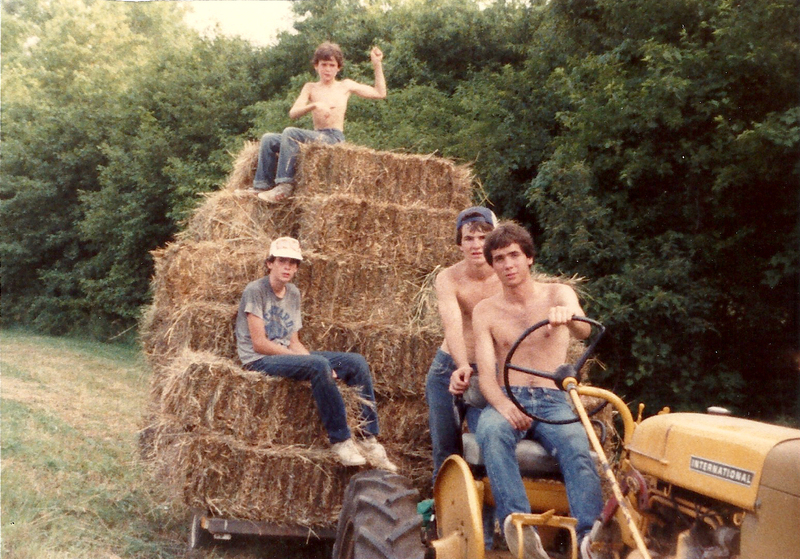 Tom Brogan driving his grandmother’s tractor, with his brothers Tim, Ted, and Terry, 1982. When I first arrived in Greece in the 1980’s, Athenian groceries were small affairs resembling the general stores of American Westerns. Their shelves were stocked with a few dry ingredients and the fresh produce needed to make seasonal Greek dishes from scratch. I was only 22 and did not have the faintest idea how to convert them into moussaka or pastitsio, let alone dolmades or youvetsi. My plans for American, Indian, and Mexican dishes also failed miserably because so few ingredients were available. All this changed, however, during the boom years before and after 2000 when easy credit brought every convenience to Greece and in particular to Athens. 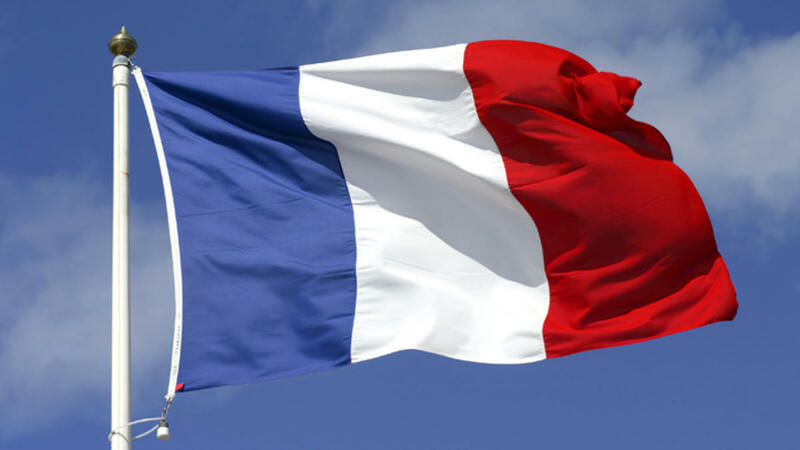 Suddenly the Greek, French and German groceries were stocked to the brim with ingredients to make any foreign meal one could imagine. The only question was where to start. In a desperate attempt to tease my son’s palate, I began making dishes like boar ragu, “spaghetti alle vongole,” fajitas, and a hot curry dish with chicken, apples and coconut milk that reminded me (ironically) of England. My wife had long dreamed of travelling to India, but my own curiosity was largely satisfied by this spicy curry that (truth be told) owed more to Singapore than Dehli. This lazy pattern only changed on Valentines’ Day, 2014, when I received a copy of Madhur Jaffrey’s Curry Easy. Suddenly dinner was just as likely to be Indian as American, Mexican or even Greek and the heat index of my curry was no longer its prime measure of success. Curry Easy was a road map to a world of flavors that took almost no effort to produce. Recipes were arranged conveniently as starters, fish, meat and vegetable dishes followed by beans, rice and relishes and an overview of spices and techniques. Jaffrey introduced each with instructions on how she served them to her family and offered helpful hints on preparation, tricky ingredients, and accompanying dishes. A surprisingly small mixture of 5-10 ingredients was required to make most recipes, and almost all were available in Greek spice shops. The instructions were easy to follow and the resulting flavors truly spectacular—much better than anything on the menu at Athenian Indian restaurants (not a high bar to be sure but a standard that has improved with recent immigration). The goal was no longer a hot dish made with blended powder, but instead the wonderful, complex flavors created by mixing 3-6 spices (think turmeric, coriander, cumin, cinnamon, cardamom, and cloves) to make dishes from east Africa, Pakistan, India, Thailand, Indonesia and Malaysia. We started making two to three dishes per meal, and ended up trying more than 20 in the course of four months. Our favorites included Salmon in Bengali Mustard, Salmon in Tomato Cream Sauce (p. 56), Kerala-style Fish Curry, (p. 59), Sri Lankan Fish Curry (p. 60), Goan Prawn Curry (p. 65), Goan-style Chicken Moelho (p. 83), Parsi Chicken with Apricots (p. 91), Chicken Curry with Cardamon (p. 97), Keral Lamb Stew (p. 121), Rajasthani Red Meat (p. 122), Yoghurt Rice (p. 213), and Chapati bread (p. 222). 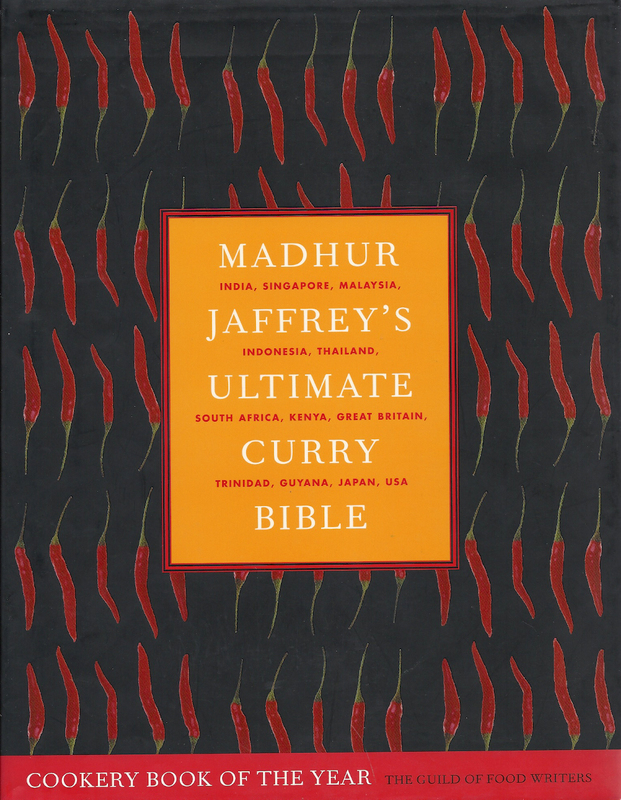 After four months my wife decided it was time to expand our horizons with Jaffrey’s Ultimate Curry Bible (UCB, hereafter). Her purpose in writing the book was twofold. “The first and most basic, is to show how a curry meal may be put together, whether you have a lot of time or a little, access to many ethnic ingredients or a few. 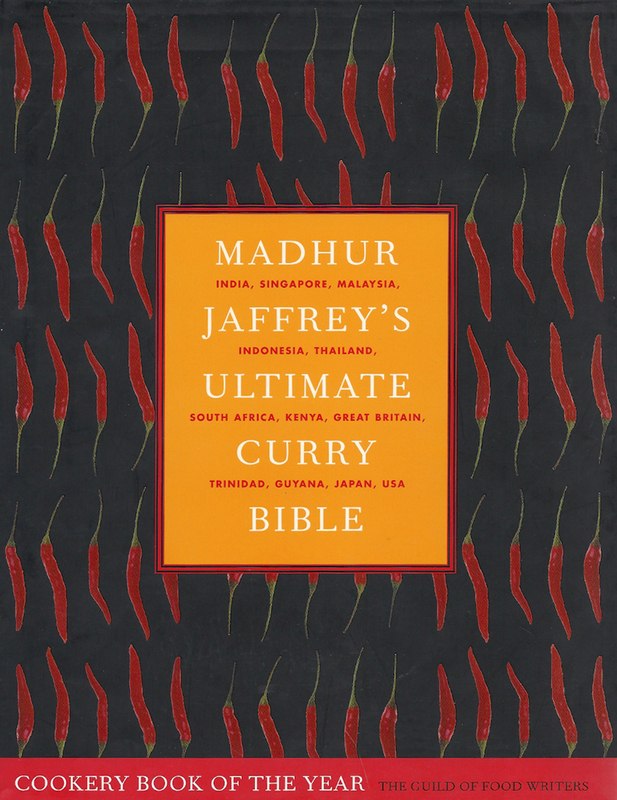 The second, which absorbs me immensely, is to compile a history of curries the world over (p. 8. )” She plotted her course with a concise introduction to how curry spread across the globe on the boats or backs of the various traders, moguls, and communities of the British Empire. Foreigners and Indians introduced new habits to native cultures which were adopted and blended with local ingredients to produce a myriad of older and original flavors. 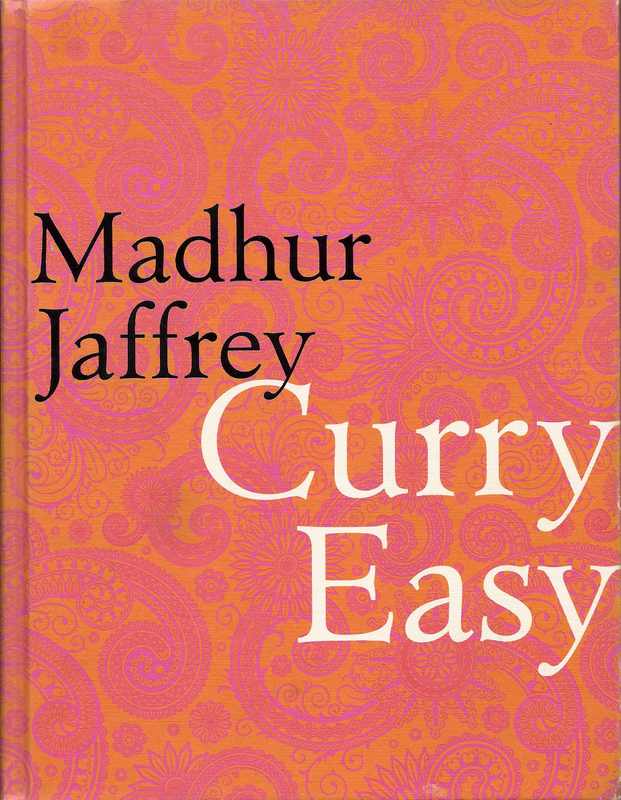 Not surprisingly, this spicy tale of globalization failed to include any curries from the American Midwest, but Jaffrey was probably saving them for her forthcoming “Penultimate Curry Bible” covering the more pedestrian paths to Indian dining (think fusion or confusion off Route 40). In the UCB a short story introduces each recipe with tales of its global origins and cultural highlights. Some are more complicated than others, but the results are worth the extra effort. We quickly fell for Lamb with potatoes (Pakistan), Goan pork with potatoes (Portuguese India), Stir fried pork in Chinese curry (Hong Kong), Green coriander chicken (Kenya), Royal chicken Korma (Indian and unlike any boring Korma now served in restaurants), Chicken curry with cashew coconut sauce (Sri Lanka and our family favorite), Cardamom and black pepper chicken (UK), Easy chickpea curry (India), Chicken satay (Indonesia), Curried jasmine rice (Thailand), Plain Guyanese bread (Guyana/Trinidad), Spicy peanut sauce (Indonesia), and Walnut mint chutney (Pakistan) to name just a few. 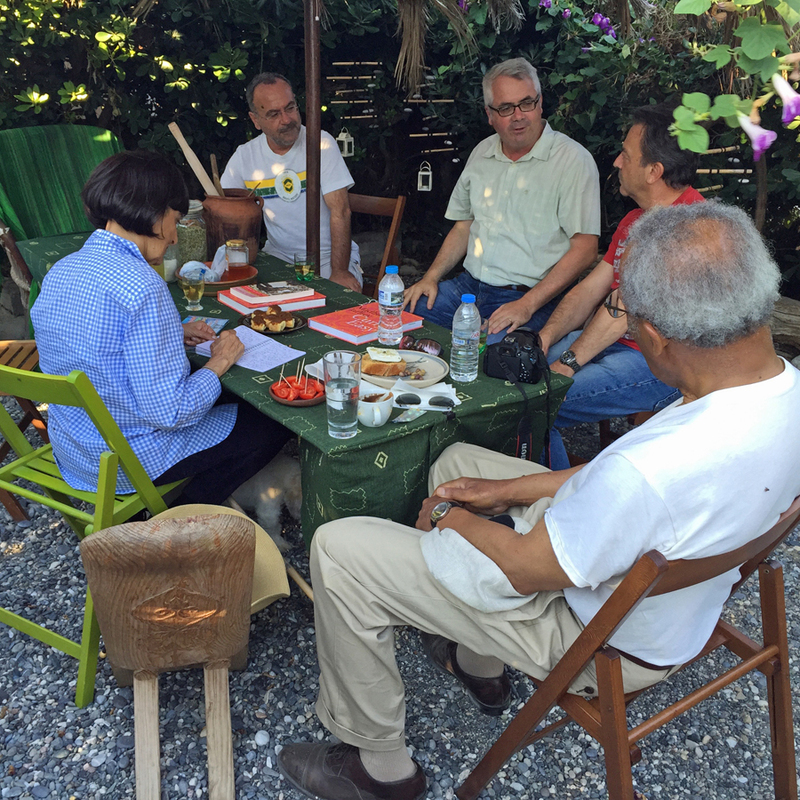 With my slow route to the “Curry Kitchen” secure, in late July I received a surprising invitation from a colleague on Crete. 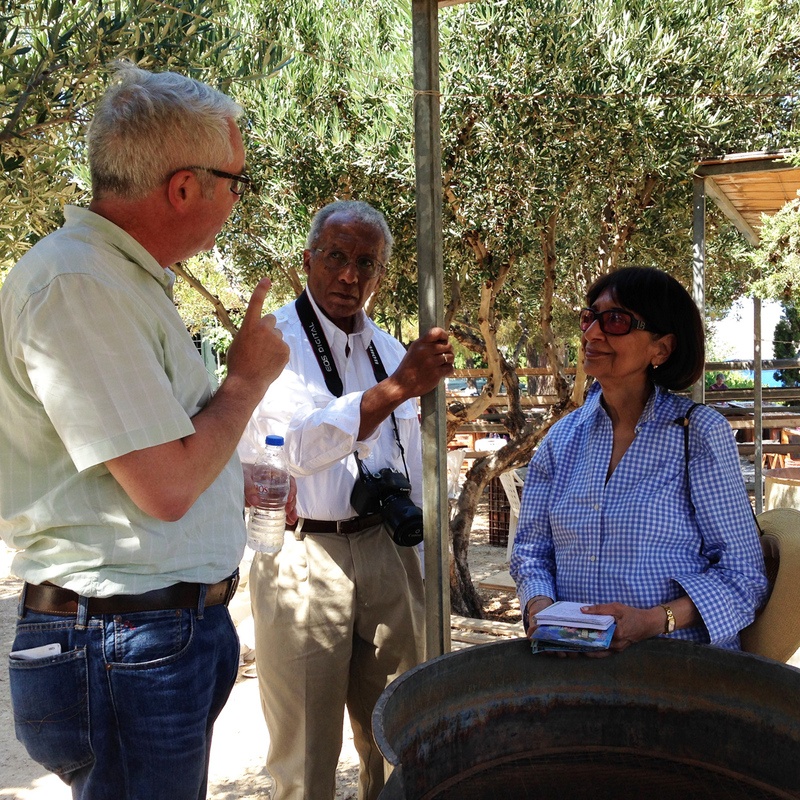 Dr. Jerolyn Morrison, who specializes in the study of Bronze Age Cretan cuisine by recreating Minoan meals, mentioned that Madhur Jaffrey would be on Crete exploring the island’s approach to seafood. 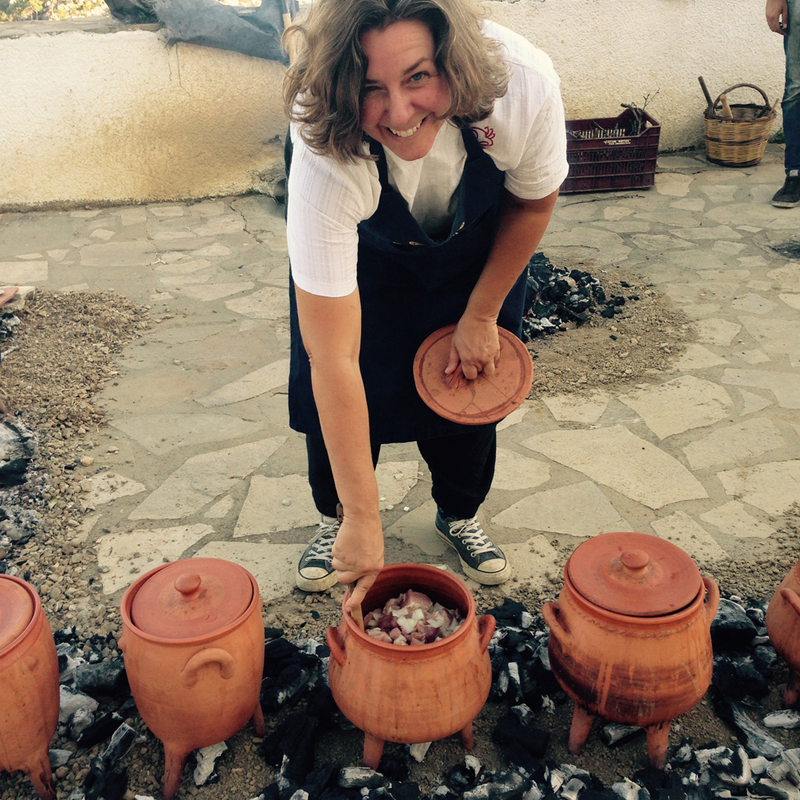 She had been asked to host Madhur for a meal of squid, octopus, and tuna using pottery and techniques modeled on finds from Cretan Bronze Age kitchens (ca. 1450 B.C.). She asked if I would be willing to give a tour of the Minoan settlement of Gournia to Madhur and her husband Sanford Allen before joining her small gang of Cretan friends for a Minoan feast. I said yes without a second thought. Surprisingly, we spent very little time discussing Indian food. Most of the conservation concerned the Minoan past and Cretan present, and in particular how Cretans traditionally prepared seafood. It was a magical evening with spectacular food and charming company — for me the latest in a long line of unexpected discoveries in Greece, which did not involve excavation. 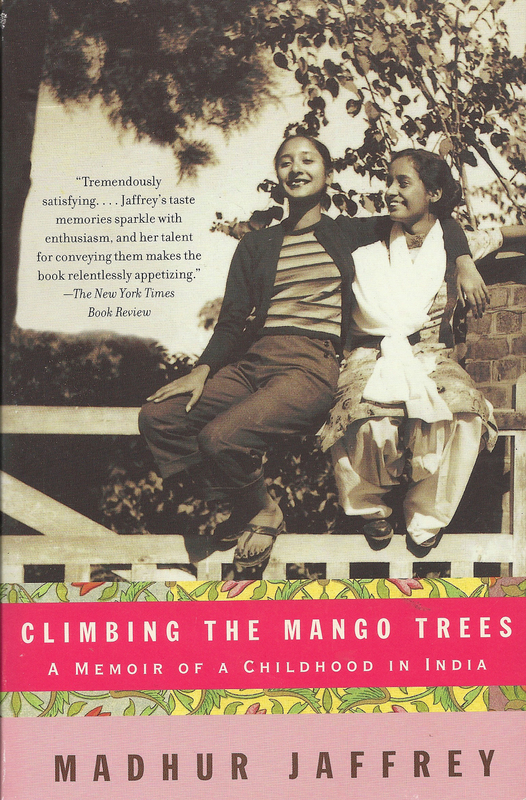 As parting gifts, Madhur offered us a pair of books—Easy Curry and Climbing the Mango Trees (her memoir of childhood in India), which was funny because I lugged my own copy of Easy Curry to dinner hoping to get MJ’s autograph. I took home CMT which tells the story of Jaffrey’s upbringing in a wealthy Hindu household before and after the Second World War. Essentially, Madhur describes an imperial culture and city (Dehli) that disappeared in the wake of independence, partition, and the emergence of a new Indian identity. Along the way, she traces her own unforeseen path toward an award-winning career acting in films (including several produced by her friends James Merchant and Ismail Ivory) and writing about Indian cooking. Her journey from Indian to England and America (which would eventually earn her the rank of Commander of the British Empire) is truly fascinating and the book tells the first leg with an intimate view of her large, prosperous Indian family teaming with archetypal personalities and characters. While enjoying successful careers and the best of pre- and post-partition Indian culture, Jaffrey’s family was certainly not immune to loss and intrigue. Food, however, provided a wonderful constant in the flotsam and jetsam of everyday life. At home there were endless meals deliciously prepared by her mother or house staff with produce picked from the family garden. These were often grand affairs overseen by her grandfather “Babaji” and attended by all her uncles, aunts, sisters and cousins and any family friend that happened to be in the house that day. The benefit of time and distance give Jaffrey the perspective to tease out the sweet and savory details of these people and events. She describes almost by accident the ingredients and the techniques used in the household kitchen and the central role that food played at the local English school for girls, as a catalyst for lunchtime interaction among the Muslim, Hindu, and foreign students. Ironically, Madhur would leave India for drama school in the UK without any real experience in the kitchen. Her interest in cooking and her immense culinary talents were only later revealed as she struggled to find Indian food in London like that served in her childhood home. To find the answer, Madhur began writing her family for recipes in a process of discovery that sounded all too familiar. We are immensely lucky that family members answered her calls. Put simply, Madhur’s cookbooks have opened new worlds of food and culture which my family continues to discover and revisit. Her autobiography provides a glimpse of how these same meals were served and enjoyed in her own home. By some strange twist of fate, I was fortunate enough to spend an evening with this muse from the Indian kitchen. With the help of Jerolyn’s feast and a few glasses of Theo’s wine, we all enjoyed an evening filled with ex-pat stories tracing our long and very different paths to culinary discovery. That night I also found again one of those rare opportunities to travel the world without leaving home–a wonderful experience that is, however, somewhat better for your bottom line than your waste line. I like very much this kind of experiences, never mind my waste line…. Lovely descriptions of tastes that can make you travel. ienjoyed your blog as I know Madhur and hae known her from my years in London with Ismail.